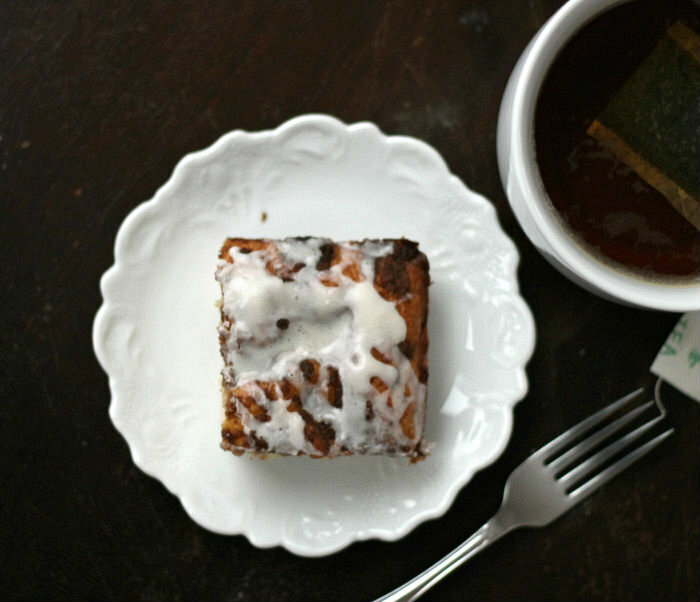 A simple of coffee cake that is a family favorite! Old Man Winter dumped a ton of snow on us last night. Okay, not a ton, but 7 inches. Doesn’t he know that it is springtime? Just isn’t fair. I spent a couple of hours of shoveling and snow blowing; I sure hope this is the last of the white stuff until next winter. 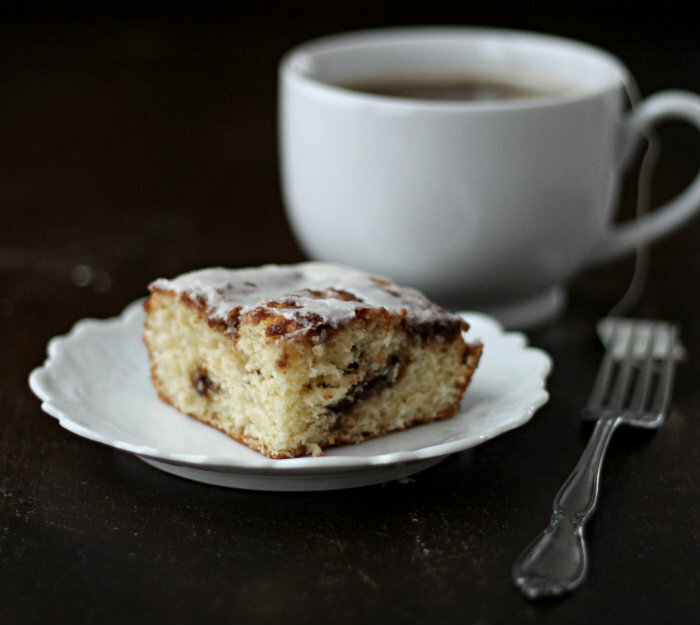 Coffee cake is a great way to cheer oneself up after all that shoveling. When Mike and I got married 30 some years ago, I received a Better Homes and Gardens Cook Book. The book is really falling apart after all those years of use, but it is still one of my favorite cookbooks, even though new versions have come and gone. I have been making this spicy topping coffee cake forever. And you know what? It is still my families favorite coffee cake. I have made some quite yummy coffee cakes in my time, but for some reason they still love this one the most. It’s okay with me, it is easy to make and I really do enjoy the flavor too. I do like to change it up once in a while. With the one in the pictures I decided to add some of the crumb topping to the center and I added some vanilla icing for a little variety. It funny how some of the simplest things can become your family favorites. Enough cream to make the icing the right consistency for drizzling. In a medium bowl sift together the flour, sugar, baking powder, and salt. In another bowl combine the oil, egg, and milk. Pour the liquid mixture into the flour mixture and stir until well combined. Combine the ingredients for the spicy topping and mix together with a fork. Grease a 8 by 8 cake pan. Spread half of the coffee cake batter on the bottom of the cake pan. Sprinkle half of the spicy topping over the batter. Carefully spread the rest of the coffee cake batter over top of the spicy topping. Sprinkle the rest of the spicy topping over the batter. Bake in an oven that has been preheated to 375 degree F for 25 minutes. Once coffee cake is cooled mix up the icing and drizzle over top of coffee cake. Adapted from Better Homes and Gardens New Cook Book. I love coffee cakes. They are easy to make and so delicious too. That cinnamon topping sounds amazing! 7 INCHES?!? OMG. I’d be a hot mess right now if I were you. 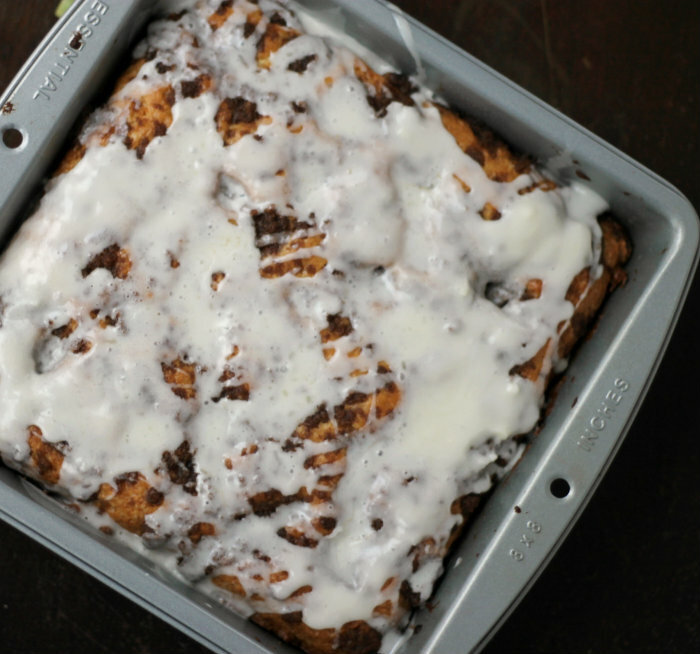 Good to see you’re coping with coffee cake…that’s the right way to do it. There are so many great recipes for coffee cake and I have to admit I’ve never tried one I didn’t like. Yours looks both easy to put together and delicious. Guess I’ll have to try it. I shouldn’t complain about snow, because we really haven’t had that much this year. But I’m sick of it — hope we’re over it. 😉 Anyway, this is a wonderful coffee cake — thanks. 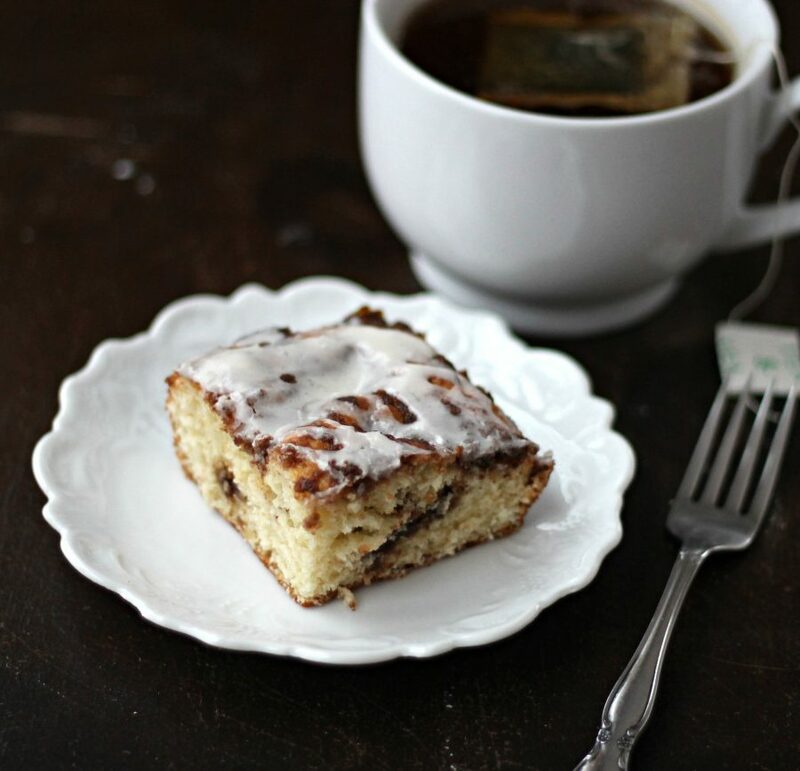 Simple is good…nothing like a slice of the fresh baked coffee cake with a cup of coffee or tea…thanks for the recipe Dawn.